HOUSTON - Winter is back with a gusto Friday! Temperatures dropped by more than 30 degrees overnight as a cold front moved through the Houston region. Cloudy, windy and raw with some reports of sleet and even some snow flurries have been falling through most of the morning and we'll see more into the rest of the afternoon. Thankfully, the ground is above freezing so we're not expecting any travel impacts through today. Sleet was falling outside the KPRC2 studios. Did you shoot photos and videos of sleet? Email them to share@click2houston.com or upload them at www.click2houston.com/share. Gusty north winds are adding insult to injury, making those lower 40s feel more like the upper 20s and low 30s. Temperatures will struggle to get into the mid 40s this afternoon and we'll keep it cold through this evening with mid to upper 30s late Friday night. 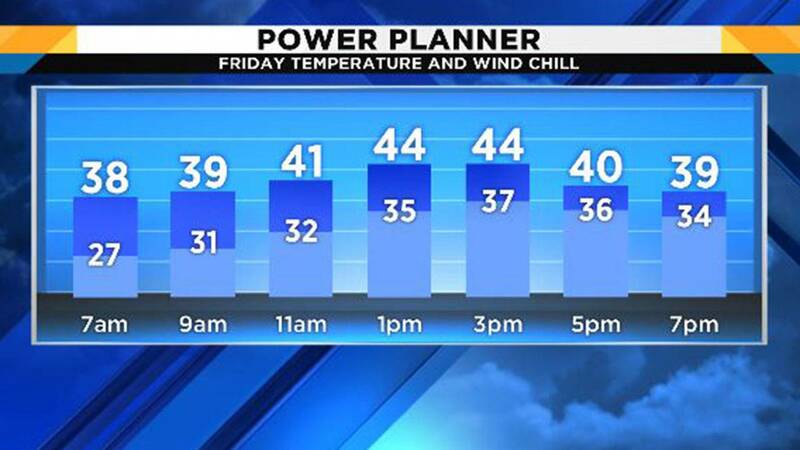 The cold weather sticks around for Saturday, with a light freeze possible in the morning. Temperatures will barely make it to 50 degrees in the afternoon under cloudy skies. Warmer weather returns next week, with temperatures in the 70s by Monday. Rain also returns to the forecast Monday.